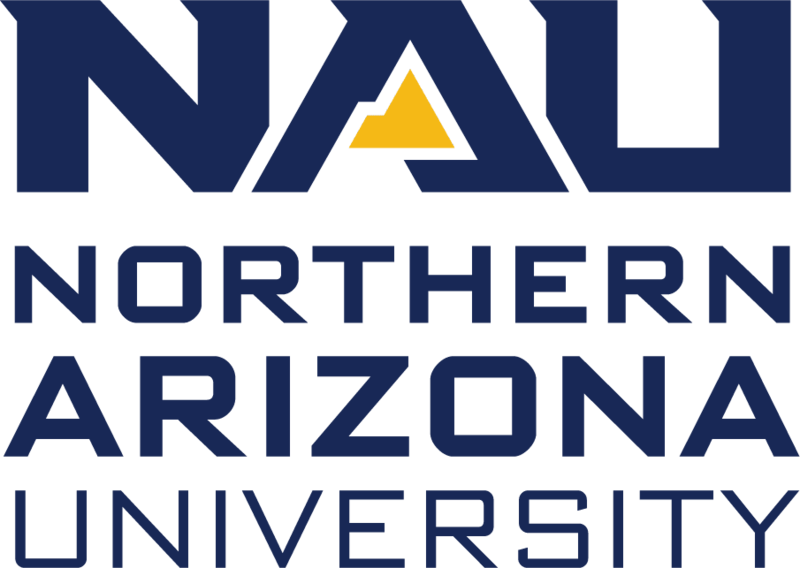 Northern Arizona University’s Strategic Space Planning Committee has officially kicked off the Strategic Space Utilization Assessment—the first phase of a new campus master plan. The survey—conducted by Sasaki, a leading national space and master planning firm—will inventory all existing spaces by type, analyze usage and provide recommendations for how space can be best utilized on NAU’s campus. The study will entail numerous workshops over the next few months, and the entire campus community is encouraged to participate. An online, interactive, campus-wide survey will be deployed next week that will allow individuals to comment on how they use and experience existing spaces on campus. The MyCampus survey will provide an opportunity to engage the campus community and deliver a clear summary to leadership on how well the campus meets its institutional needs. Please expect to receive an invitation to the survey next week. 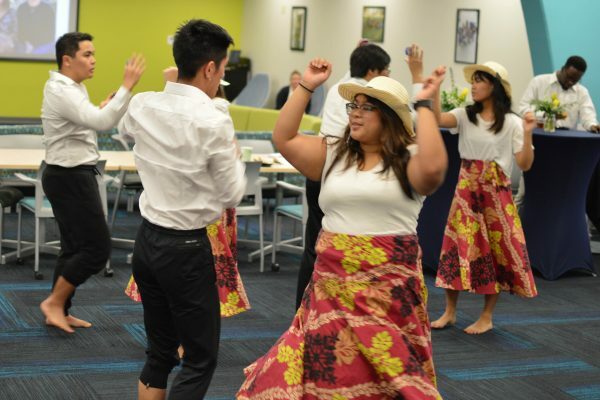 After the snowstorm delayed the grand opening of the Office of Inclusion: Multicultural and LGBTQIA Student Services (IMQ) Center, the rescheduled event took place on Tuesday. More than 100 people came to celebrate the new space, which includes an expanded student space, a rainbow lounge, study area and programming center with computers and monitors. The Mariachi Mar y Sol, HAPA Hawaiian Club and Divine 9 fraternity were just a few of the clubs and organizations that performed at the opening, demonstrating music from throughout the world, the hula, step, traditional dances and more. Ivy Banks, director of the IMQ center, and Erin Grisham, associate vice president and interim dean of students, also spoke at the event, which concluded with a group-wide Cupid Shuffle dance. 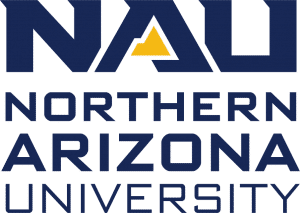 The IMQ center, which supports students through cultural, gender and sexual diversity in a safe environment, is located in the University Fieldhouse, room 145—the NAU community is encouraged to stop by anytime to check out the new space. If you haven’t gotten a chance to check out NAU’s newest addition to campus, here is a behind-the-scenes look at the space. From an intricate lighting system and wood-paneled stage to bouncy, shock-absorbing floors in the rehearsal area, Todd Sullivan, director of the School of Music, students and faculty alike are happy to have a place to call their own. Although the North American quaking aspen tree is a time-honored local icon here in Flagstaff, it has the broadest distribution of any tree on the continent, growing from coast to coast across the U.S. and Canada. It’s also a close relative of the Eurasian trembling aspen, which can be found in Europe, Asia and parts of Africa. The two species belong to the genus Populus, and because of their prevalence across the northern hemisphere, a multidisciplinary international team of 26 scientists recently completed the first study to understand how genomic determinants affected the trees’ adaptive evolution. The study is important because it provides a starting point for comparative and evolutionary genomics in the field of forest trees. Assistant professor of forest genetics Amanda De La Torre, who joined NAU’s School of Forestry in 2018, collaborated on the team and co-authored a paper in the Proceedings of the National Academy of Sciences describing the study, which produced the first aspen genome sequences. By selecting these species for the study, De La Torre and her collaborators—from Ghent University, Umeå University, Swedish University of Agricultural Sciences, the Institute of Life Sciences, Uppsala University, Royal Botanic Gardens and Norwegian University of Life Sciences—established the aspen genome as a basis for future studies. “We have demonstrated the power of the aspen genome resources for understanding how natural selection varies among genes differing in gene expression, and how effects of linked selection vary across the genome within and among species to help decipher the history of speciation in aspens and identify the genomic basis of local adaptation,” said De La Torre. The Populus genus has a number of novel features compared to many other model systems, including its ability to self-clone, great longevity—the oldest living organism in the world is an 80,000-year-old aspen grove—and abundant genomic diversity. To facilitate future studies of the many novel aspects of Populus biology, the team integrated all data generated during the study into the Populus Genome Integrative Explorer web resource. “These data will serve researchers performing evolutionary and comparative analyses as well as functional genomics studies aimed at deciphering genes underlying complex phenotypes by, for instance, aiding with the design of CRISPR guided-RNAs (ribonucleic acids) for gene editing,” said De La Torre. 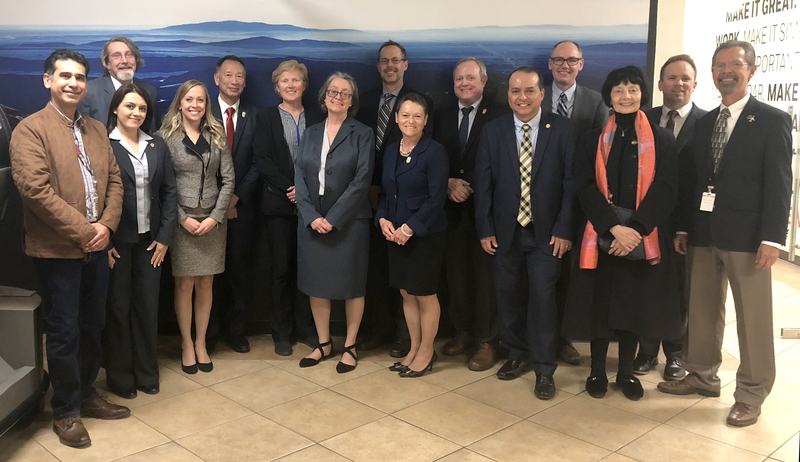 NAU President Rita Cheng led a delegation of university leadership to partner institution Center for Technical and Higher Education University (CETYS) in Mexicali, Mexico, earlier this month to further develop programming and collaborative initiatives between the two institutions. University leadership and staff from various departments across the Flagstaff campus and NAU-Yuma joined the presidential delegation, including: David Schultz, vice president for research; Daniel Palm, associate vice president for global initiatives and executive director for the Center for International Education; Michael Sabath, campus executive officer for NAU-Yuma; Diane Stearns, interim dean of the College of Engineering, Informatics, and Applied Sciences; Kevin Trainor, associate dean of the W.A. Franke College of Business; Tom Cheng, executive-in-residence; Alex Steenstra, chair of business department at NAU-Yuma; and Kristin Allen, program manager for Latin American Initiatives. CETYS President Fernando León García opened the meeting and welcomed the group to CETYS’s Center for Excellence in Competitiveness and Entrepreneurship (CECE), emphasizing the importance of international collaboration among institutions of higher education to create global opportunities that prepare students to participate in the social, cultural and economic improvement in multiple countries throughout the world. Following conversation surrounding campus internationalization and collaboration in areas of engineering and business, the group visited CETYS’s new Center for Innovation and Design (CEID). Inaugurated in January 2018, the CEID houses CETYS’s engineering learning community and aims to provide solutions for continuous improvement and stimulate innovation and growth across industry and business. While there, first-year robotics students shared projects in areas of transportation (autonomous vehicles) and conservation (hydroponics) with the group. 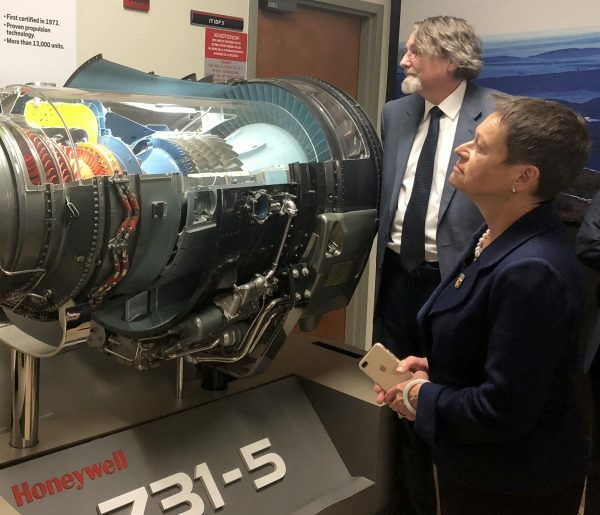 Cheng and Schultz tour Honeywell. The group also had the opportunity to tour Honeywell’s aerospace testing lab while in Mexicali, a unique location that houses a wind tunnel to support the 777X platform by Boeing and enables continued development of Honeywell’s engineering capacities. CETYS fosters strong relationships between corporations and industry throughout Mexicali, which in turn has provided NAU’s faculty-led programs with access to important site visits such as Honeywell, Kenworth and SkyWorks over the last few years. While NAU and CETYS have seen both student and faculty short-term exchange in international business, this visit aims to further the partnership to include collaborative research and investigation in strategic areas such as logistics, renewable energies and water management, as well the establishment of a bilateral student exchange, dual-degree programming and cross-border leadership training opportunities.